We’d love your help. 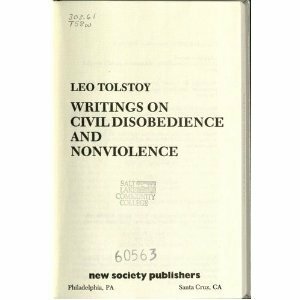 Let us know what’s wrong with this preview of Writings on Civil Disobedience and Non Violence by Leo Tolstoy. Gathered for the first time, prophetic writings by the author of War and Peace that speak directly to America's dilemma with the urgency of today's headlines. To ask other readers questions about Writings on Civil Disobedience and Non Violence, please sign up. 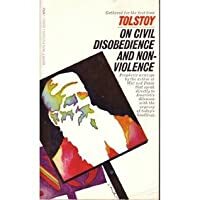 In Writings on Civil Disobedience and Nonviolence Tolstoy is a little heavy on the Christianity for me even if he is talking about the good Jesus Christianity rather than the bad institutional Christianity. I gave it three stars, an extra one because the topic of nonviolent civil disobedience is not found in much writing. I found it hard to get to the end of this book. It began to seem like I was reading the same thing over and over. Tolstoy’s writing is from 150 years ago and represents a part In Writings on Civil Disobedience and Nonviolence Tolstoy is a little heavy on the Christianity for me even if he is talking about the good Jesus Christianity rather than the bad institutional Christianity. I gave it three stars, an extra one because the topic of nonviolent civil disobedience is not found in much writing. I found it hard to get to the end of this book. It began to seem like I was reading the same thing over and over. Tolstoy’s writing is from 150 years ago and represents a part of the foundation for this modern day philosophy. Got to tip my hat to an ethic that says I would rather die than violate my conscience. A conversation about doing the right thing regardless of the consequences with Immanuel Kant (who lived in the 18th century) and Tolstoy would be interesting. Tolstoy lived in Russia from 1828 until 1910. Most people know him because of War & Peace and Anna Karenina; fewer know that he was a pacifist and Christian anarchist when he died. Writings on Civil Disobedience and Nonviolence is a collection of letters and essays. You might say that Tolstoy originated the phrase Power to the People. He says that a belief can start with one person and spread to the masses from there. His core belief is “I will not kill.” He did not believe in the institutional Christian church, premising his Christian belief on Jesus. “Only the complete and utter destruction of institutionalized Christianity in all it manifestations would, according to Tolstoy, open the way for a full appreciation and acceptance of Jesus,” said David Albert in the introduction to the book. Now, I am not a religious person but I can relate to the organized Church being a force for evil and Jesus being a role model worthy of emulation. Tolstoy takes this quite literally. Tolstoy is severe. He uses hard and damning words: perversion, fraud, idolatry, abhorrent. “We, by God’s grace, the autocratic great Emperor of all Russia, King of Poland, Grand Duke of Finland, etc., etc., proclaim to all our true subjects, that, for the welfare of these our beloved subjects, bequeathed by God into our care, we have found it our duty before God to send them to slaughter. God be with us.” Made Tolstoy want to puke! Ah, but aren’t people in Tolstoy’s day in the 19th century afraid of the consequence of this civil disobedience and nonviolence? “But what will happen when all people refuse military service, and there is no check nor hold over the wicked, and the wicked triumph, and there is no protection against savage people – against the yellow race – who will come and conquer us?” You could fast forward to 2010 and hear the same arguments. Tolstoy replies, “I will say nothing about the fact that, as it is, the wicked have long been triumphing….” And he goes on. Is he convincing? Apparently not since we are still having the same argument 150 years later! And it is true throughout these letters and essays written in the 19th century, they could be letters to the editor in the 21st century. Tolstoy, like the Quakers and Mennonites, was blazing a path that some of us still try to follow. What does this writing from the 19th century have to say to us in the 21st century? And similarly, what of the words of the American writer Henry David Thoreau who wrote On the Duty of Civil Disobedience at the same period of the 19th Century? Social action and social criticism is an international reality even in the face of awful consequences. According to Tolstoy, you cannot oppose evil with violence; he called that non-resistance. Today we would call it nonviolence. Tolstoy is brilliant, of course. I just wish this book were better edited. The various pieces Tolstoy wrote are given no context; no dates, only occasional information on why a piece was written, and a dearth of information on where pieces were originally published. Very frustrating for a researcher. Lots of writing on nonviolence, though more on resistance to the state, and the perils of patriotism. Tolstoy saw that the very basic human interactions were where peace begins. Peace isn't going to come about through government programs or international organizations. In this series of essays, he investigates several isssues from multiple angles. Policymakers, soldiers, and citizens are thoughtfully considered. He pokes holes in the standard ways of thinking about war and peace. He can be preachy, but all in all this is an excellent collection that presents important viewpoints. Huolimatta siitä, että kirja on kirjoitettu jo satakunta vuotta sitten Tolstoin ajatukset ovat edelleen hyvin ajankohtaiset ja terävät. Kirjan tekstityyli on välillä nykypäivään turhan raskas, mutta kontekstiin asetettuna toimiva. Rauhanliikkeen klassikko! Rehellistä ja suoraa, rauhaan ja omantunnon kuuntelemiseen ja teoista vastuunkantavaan toimintaan tähtäävää kirjoitusta, joka vaikka kirjoitettu 1800/1900-lukujen vaihteessa, on edelleen ja tullee aina olemaan, ajattoman ajankohtainen. Tätä lukiessa tuntui, että astuin aurinkoisella bussipysäkillä kirja kädessä yhteiskunnan sääntöjen tuolle puolen, kohti oikeutta ja totuutta, niin väkevää tekstiä se ajoittain oli. Mielenkiintoisia näkökulmia rauhanaatteesta ja patriotismin vastustamisesta. "Hallitukset vakuuttavat kansoille, että näitä uhkaavat vaarat - toisten kansojen hyökkäys ja sisäiset viholliset - ja että ainoa keino pelastua tuolta vaaralta on kansojen orjamainen alistuminen hallitusten tahtoon. Se näkyy aivan ilmiselvästi vallankumousten ja diktatuurien aikana, ja niin tapahtuu aina ja kaikkialla, missä vain valtaa on. Jokainen hallitus selittää olemassaolonsa ja perustelee kaikki väkivallantekonsa sillä, että ellei sitä olisi, olisi pahemmin. Saatuaan kansat vakuuttuneiks "Hallitukset vakuuttavat kansoille, että näitä uhkaavat vaarat - toisten kansojen hyökkäys ja sisäiset viholliset - ja että ainoa keino pelastua tuolta vaaralta on kansojen orjamainen alistuminen hallitusten tahtoon. Se näkyy aivan ilmiselvästi vallankumousten ja diktatuurien aikana, ja niin tapahtuu aina ja kaikkialla, missä vain valtaa on. Jokainen hallitus selittää olemassaolonsa ja perustelee kaikki väkivallantekonsa sillä, että ellei sitä olisi, olisi pahemmin. Saatuaan kansat vakuuttuneiksi siitä, että ne ovat vaarassa, hallitukset alistavat ne tahtoonsa. Kun kansat sitten ovat alistuneet hallitustensa tahtoon, nuo hallitukset pakottavat kansat hyökkäämään toisten kansojen kimppuun. Ja niin kansat saavat vahvistuksen hallitusten vakuutteluihin toisten kansojen taholta uhkaavasta hyökkäysvaarasta. A truly exceptional piece of philosophy. Our entire society could be built of this short set of essays. I don't understand why it's not taught as a major and important work. One of the key premises is that governments start wars and ask (or tell) their citizens to fight them, but if we as citizens simply didn't fight, didn't pick up the weapons, then the wars of the world would end. Tolstoy describes what one might call a Christian anarchy, a world where government and laws aren't needed because A truly exceptional piece of philosophy. Our entire society could be built of this short set of essays. I don't understand why it's not taught as a major and important work. One of the key premises is that governments start wars and ask (or tell) their citizens to fight them, but if we as citizens simply didn't fight, didn't pick up the weapons, then the wars of the world would end. Tolstoy describes what one might call a Christian anarchy, a world where government and laws aren't needed because people act with morality rather than in subservience to laws or fear of punishment. I know it sounds naive, but Tolstoy lays it all out in a convincing way. His believes on civil disobedience and nonviolence, which are very Martin Luther King in nature, are excellent as well. Many passionately written essays about peace and the moral responsibility of every person. A great read and very thought-provoking. Makes one think how in our everyday life we often want to hand over moral responsibility of what are ultimately our own choises to someone else and how false that is. What can I say. I read this book to learn civil disobedience. I haven't read it in a while. The last time I read it was in high school. I might have perused it college.